It is great fun posting dramatic Before/After images. But this is a long post about a lot of Before/During. So, no WOW images. 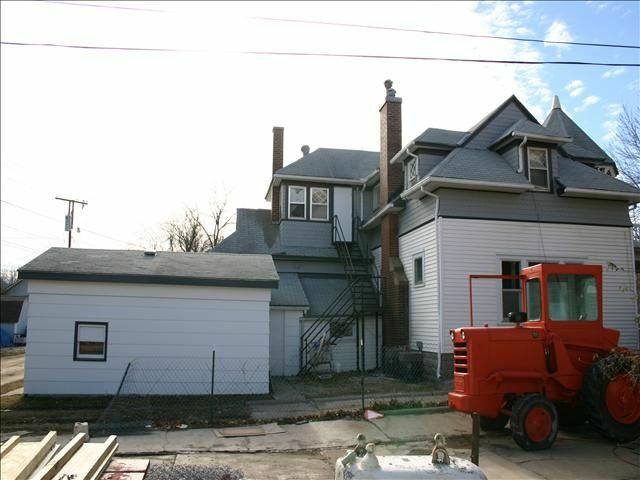 This is how the north facade of the carriage house looked a few years before I purchased it (the west side is the main facade). The 1894 2-story structure is to the right. Just behind it, left, is the 1894 1-story “barn”, with a 1921 sunporch on top. This 1-story section used to be the north wing of the carriage house; in 1921 it was moved, rotated 90-degrees, and attached to the rear of the 2-story section. I detailed this adventure in a previous post. Also in 1921, a small shed addition was built (just under the fire-escape). Then, to the left of the addition, another smaller addition was built circa-1970, attaching the house to the circa-1970 garage (far left). 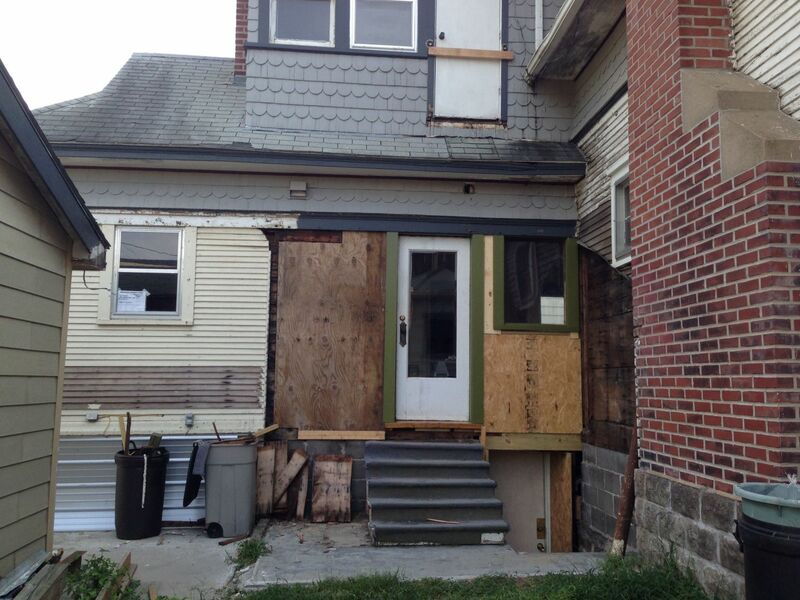 The fire-escape was removed before I purchased the property. A quick plan of what you see in the above image. NORTH would be at the bottom of the page. 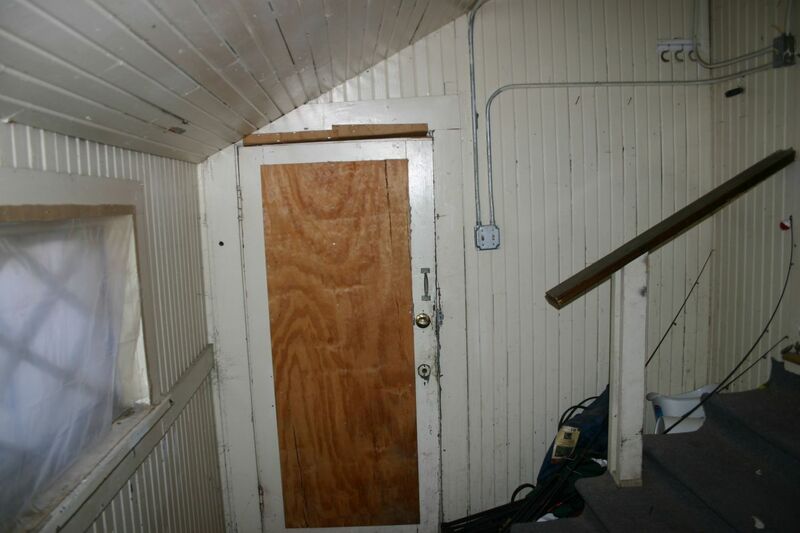 The 1921 shed addition allowed people to walk down short flight of steps from the kitchen to either go outside, or down another short flight to the basement. The addition was kinda charming. But odd. If you stood at the kitchen door, you looked down into this. 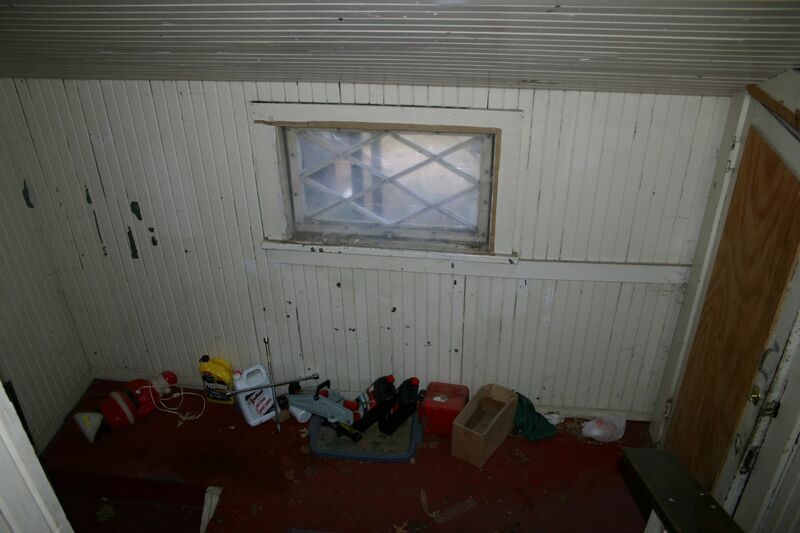 If you stood in the shed addition, this was the door leading to the 1970s addition. The steps to the right lead to the kitchen. 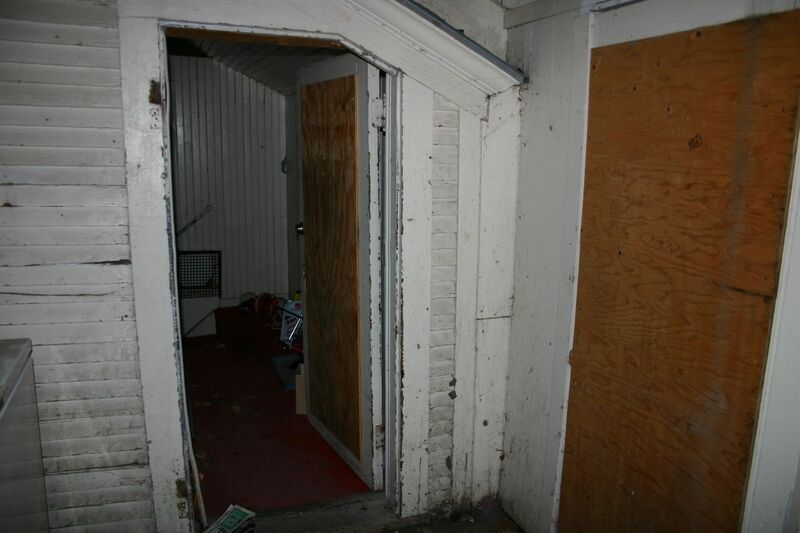 If you stood in the 1970s addition, this was the other side of that door. The 1970s addition made the north kitchen window useless. It was later covered over on the inside. You can see how the 1921 shed addition is built well, and its detailing matches the 1894 structure. The 1970s addition made no such effort at architectural civility. 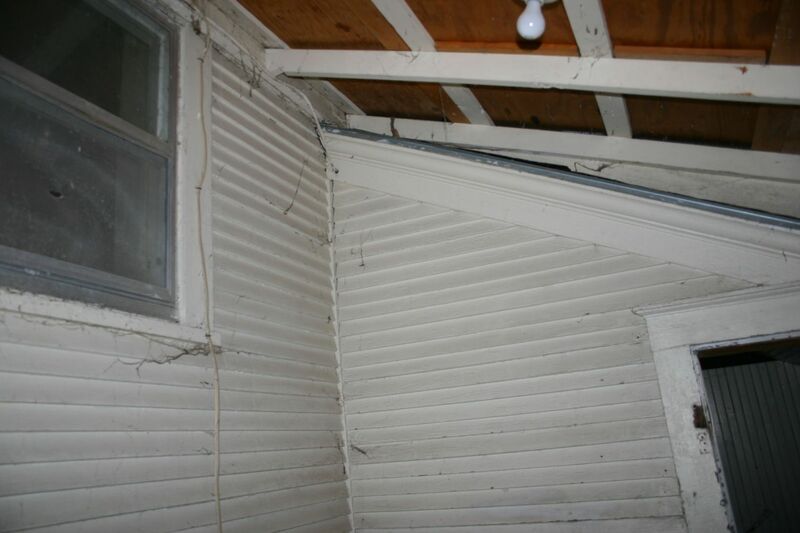 The 1921 shed addition, while charming, and historically interesting (a component of the carriage house conversion into a proper house), it prevented direct access to a yard or deck. Moreover, to entertain today, such as an outside BBQ, one would need to carefully step down a half-flight of dangerous steps, laden with food and drinks, to get outside. Argh! 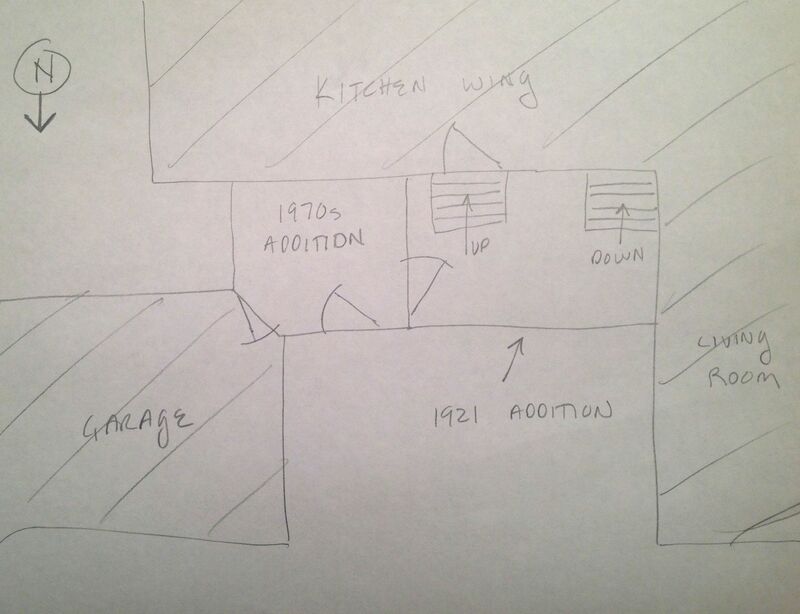 So, while removing the 1970s shed addition was a no-brainer, I gave a lot of thought to removing the 1921 shed addition. But the pros far outweighed the cons. And so off it went in 2014. The north window of the kitchen, once again, is outside. Where it belongs. Importantly, the additions also cluttered the north facade of the carriage house. And I have a low tolerance for architectural clutter. The new plan. NORTH would be at the top of the page. 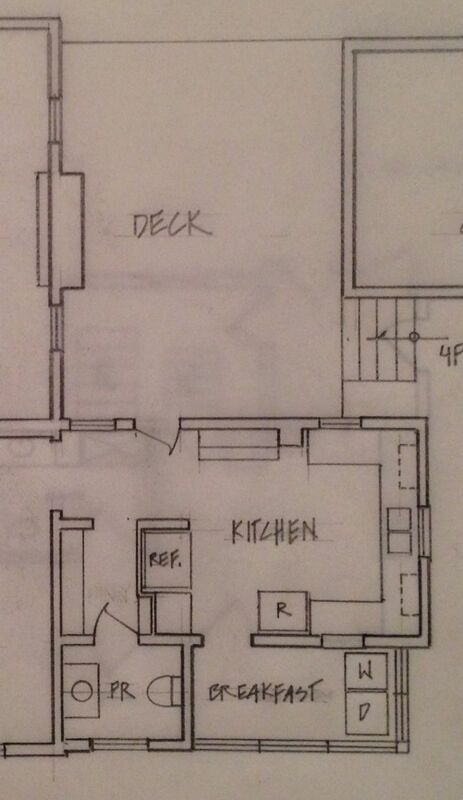 With the new plan, you will be able to walk directly from the kitchen onto a new deck. I think this will be a wonderful feature. The deck will also be quite private, as it is surrounded by structures on three sides, and I will be installing a privacy fence along the north side. 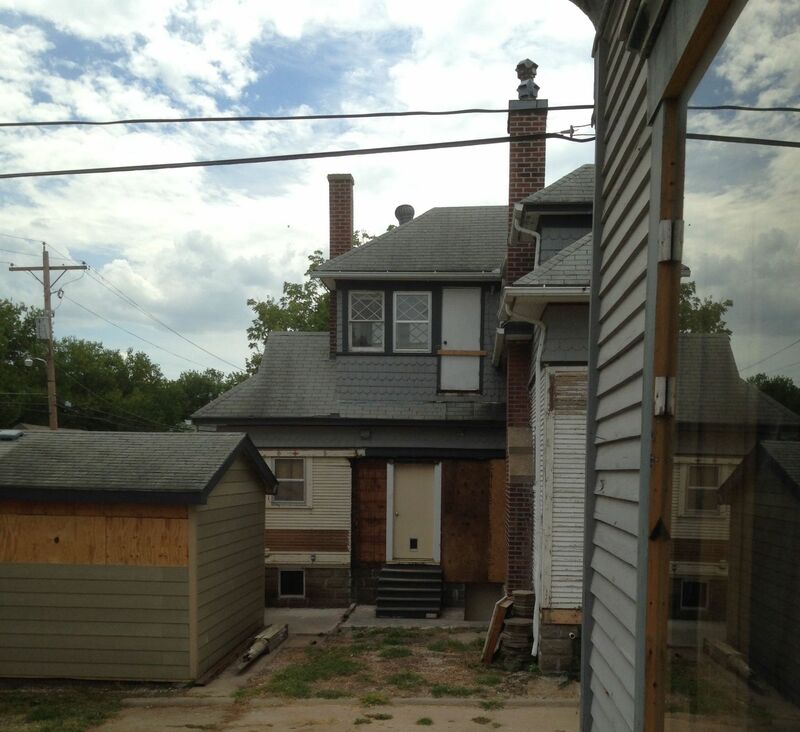 The 1921 addition was carefully taken apart rather than ruthlessly demolished. I also kept the way cool window, and will be installing it in the new powder room (see plan, above). The door is the same one shown three images above. Next to it was the 1980s bathroom which I also tore out. 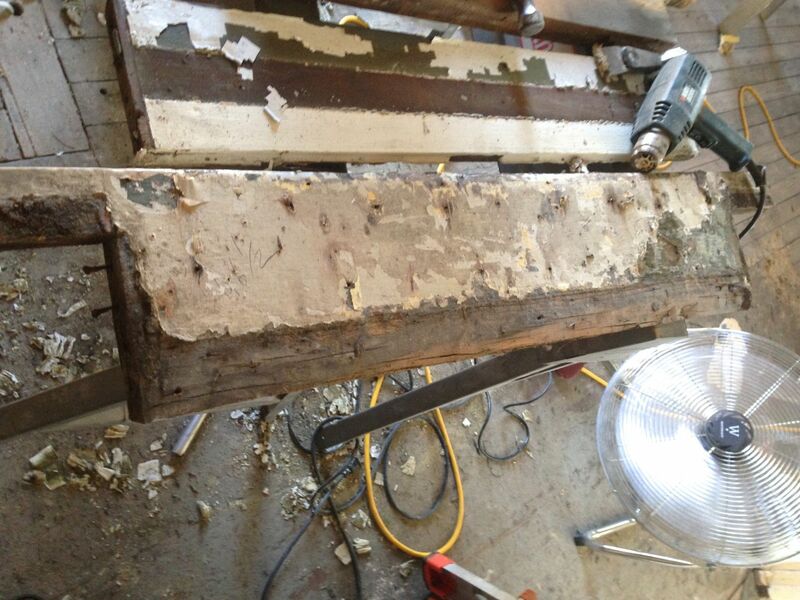 The wall was a termite- and water-damaged mess, and it also had to go. Note steel column (left) holding house up. 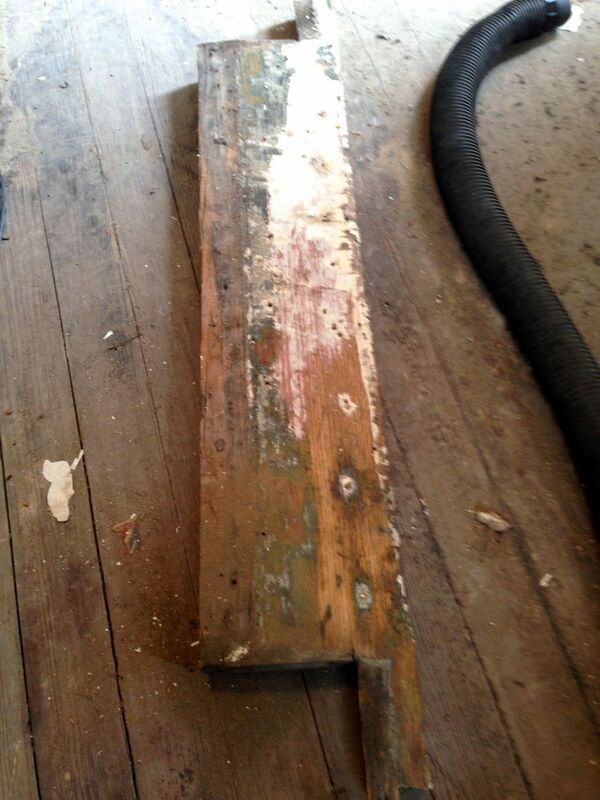 I moved the 1921 door frame (although it might be 1894) over a bit. Then I removed a 1921 window from the south end of the kitchen (just above the washer/dryer in the plan above), and moved it next to the relocated door. The window no longer served much purpose on the south wall, as the sunporch is now fully enclosed with Thermopane windows, insulated, and has heat/air. 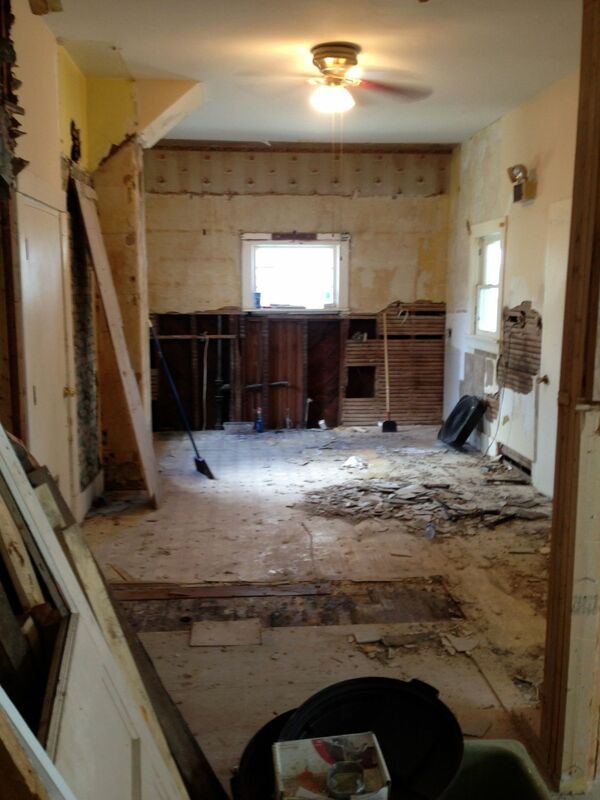 It is now a year-round space, and will be the laundry and breakfast nook. 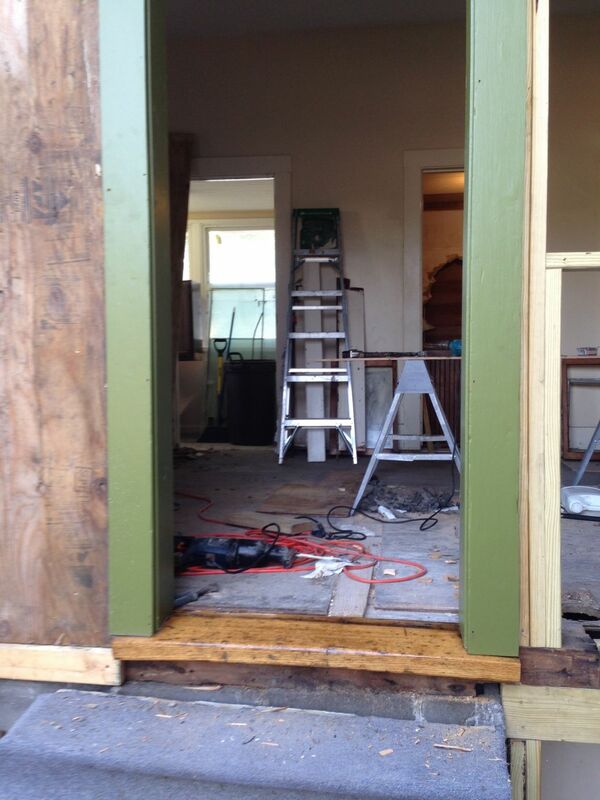 However, I plan to keep the opening, framed/trimmed to match the other windows, and use it as a pass-through. 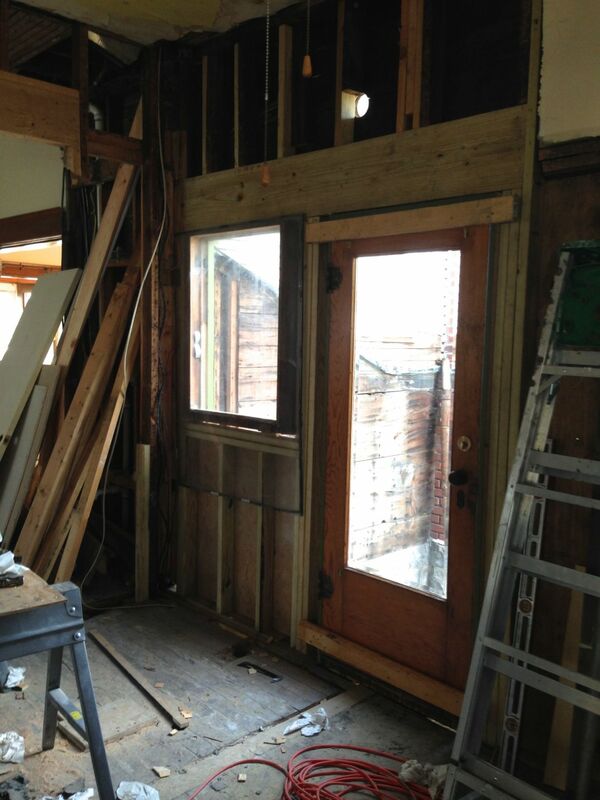 The newly relocated door frame, and newly relocated 1921 window to its right (the sashes are out and being restored). The glass door and window add a LOT more light into the kitchen. I am a fiend for light. 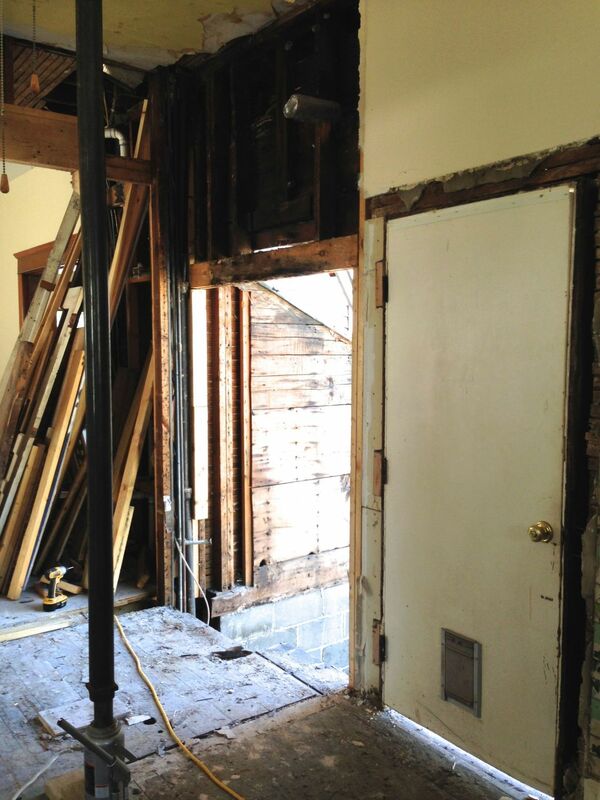 The door itself was recently purchased at a salvage yard. Beveled glass! Original hardware! The door on the second-floor will remain (it was used for the departed fire-escape), but will get replaced with a beveled-glass door, too, and will open onto a tiny Juliet balcony. It is hard to imagine that this view will be gorgeous one day. The new deck will be the same height as the kitchen floor. The door frame was a mess. 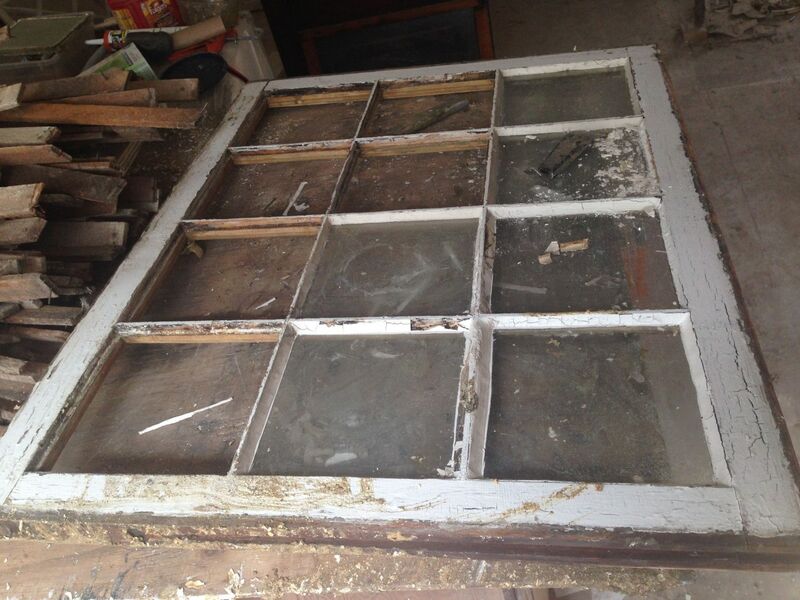 It was CAKED with a century of paint, the vertical frame was split, and other horrors. It would have been SO much less work to simply toss it, but I am, as previously noted, a nut. So, I had to do whatever I could to resurrect the grim mess. After taking the whole apart, this was the saddle. It was covered with many layers of paint, and all this was under additional layers of plywood and vinyl and new ceramic floor tile. However, the saddle was, surprisingly, oak, and amazingly heavy and thick. My curious mind raced. Could this seemingly worthless bit be saved? The first evidence that it could be! 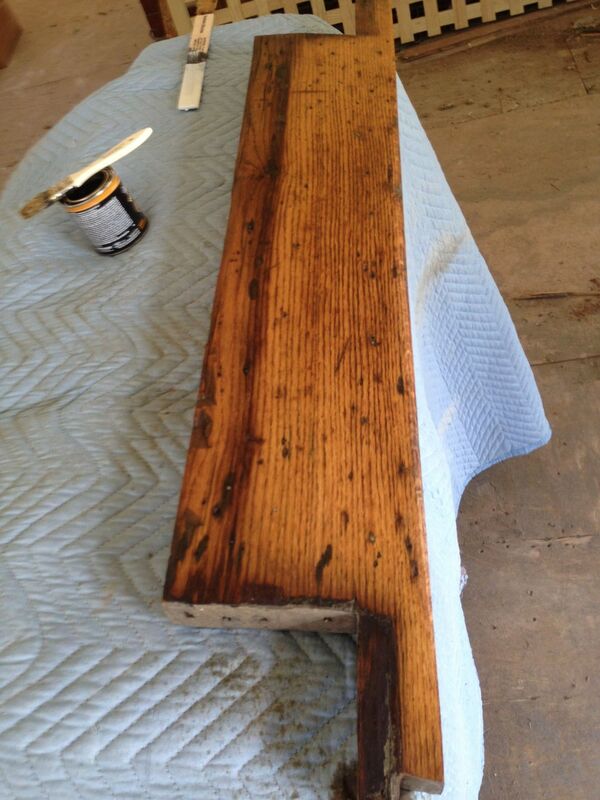 The AFTER, with 3-coats of Spar marine varnish. Ta-da! 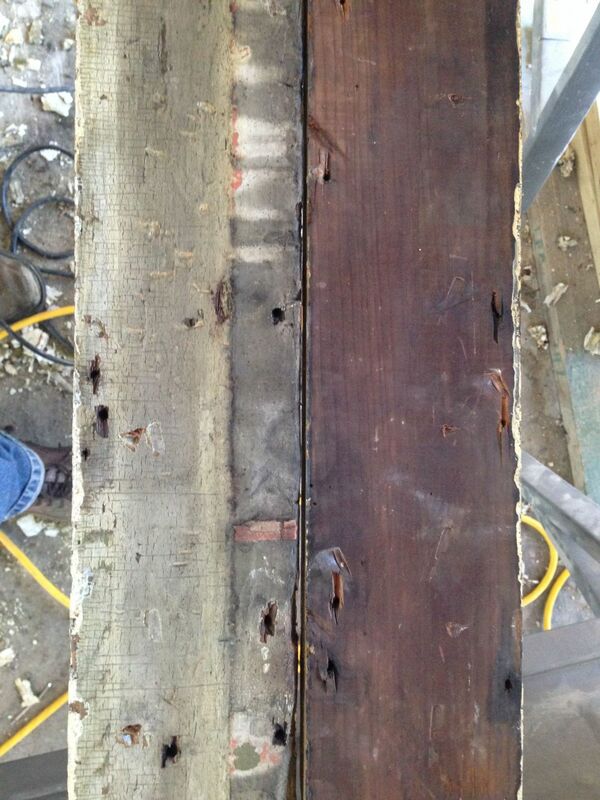 The trim is original, after having been stripped and repainted in the 1894 color. The frame itself is new oak, but the top of the frame is original. I really enjoy this process of renewal. While a new frame would have taken vastly less time, it could not possibly offer the satisfaction that the restored frame has offered, nor would a new frame have anywhere near the vintage appeal of the old frame. And I do love a good vintage appeal. 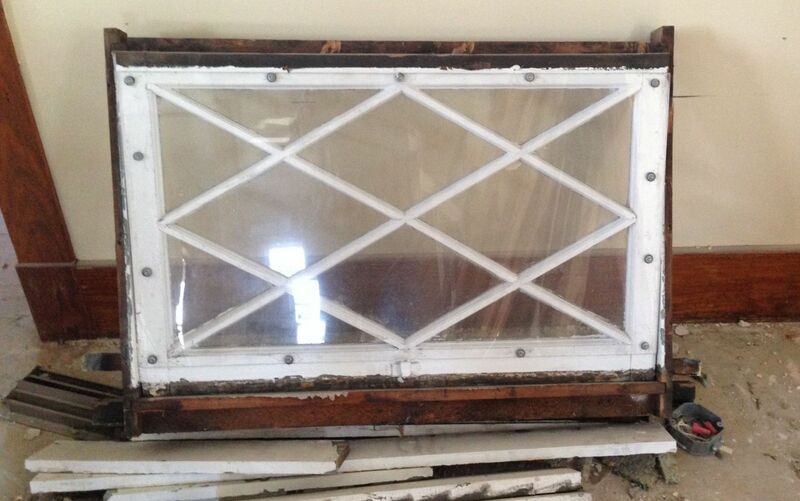 I also dismantled the 1921 window frame so I could remove all the paint. These are the two vertical exterior trim pieces. How VERY odd that they did not match. Huh? I turned the two pieces over. And an answer to the minor mystery was revealed. The piece on the right is from the 1894 structure (hence the distinctive olive green paint remaining; picture above). The piece of the left is reused! It was obviously part of the 1921 conversion. Cool! I love these kinds of discoveries, as small stories from the past are suddenly revealed. I started using a heat gun to remove all the old paint. Yes, I wore the proper respirator. 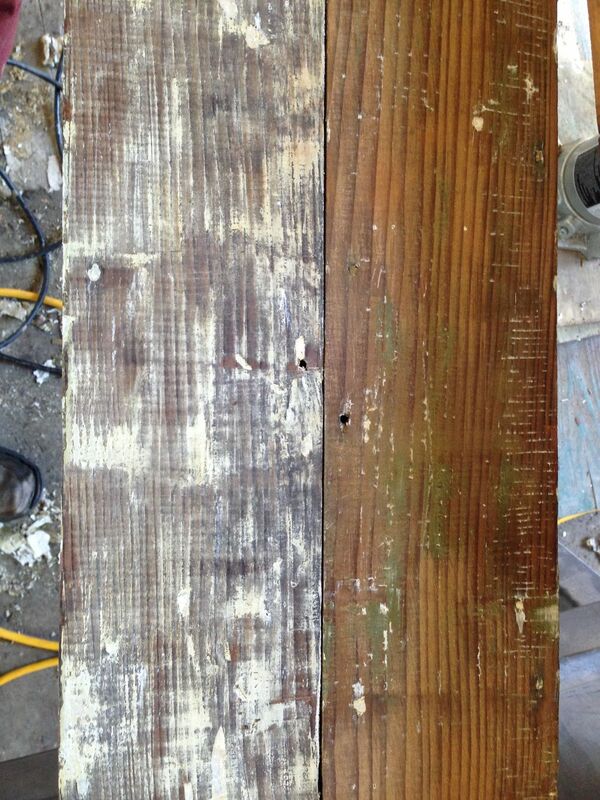 But I soon discovered that really potent paint stripper was faster and easier. I glob a lot on, walk away for several hours, and the stuff just comes right off. Then I polish with 0000 steel wool dipped in stripper. Good gloves required! Thanks for the update Ross. 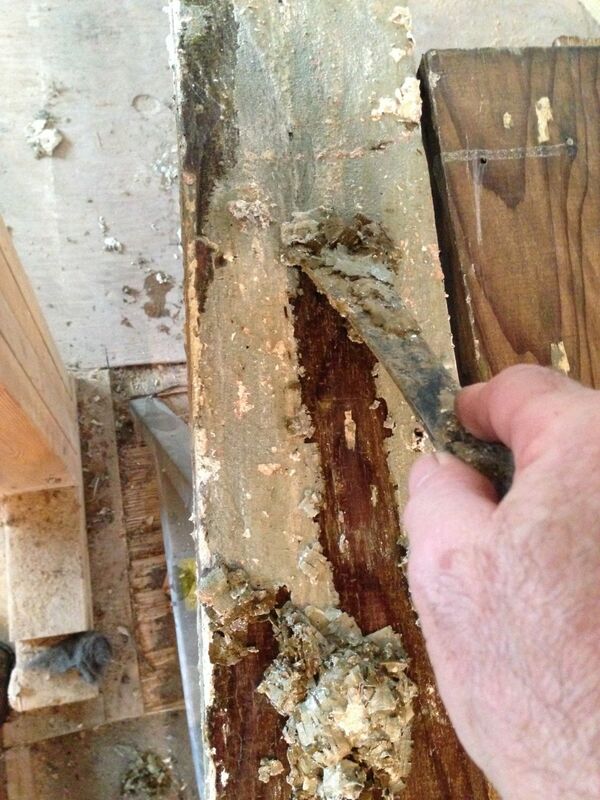 Things are looking great.I spent the weekend stripping woodwork in a bedroom myself. Was hoping for an update. Love all the progress. It is coming along so well. Have you relocated the basement access to somewhere else? Not yet. 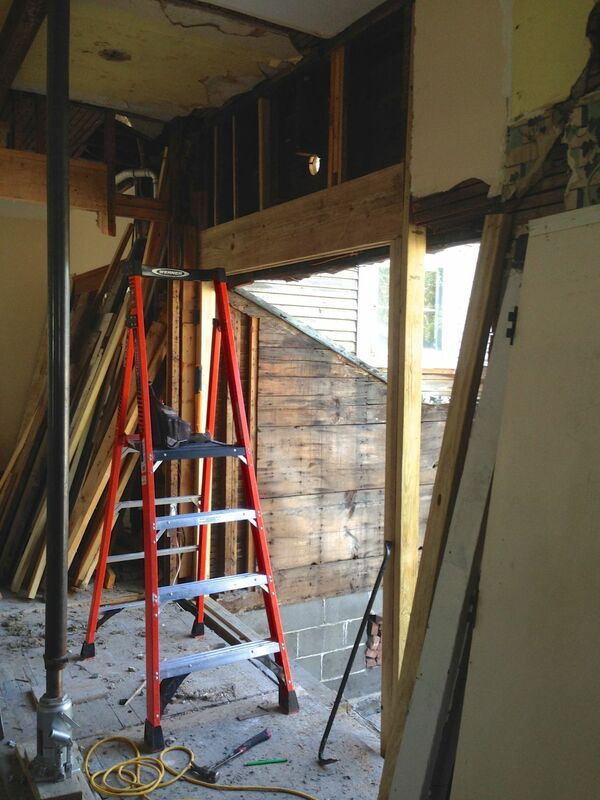 Later, I will be installing an interior basement stair. In the interim, the deck will have a trap door to access the basement. It’s so much fun to see your record of your progress. I envy the lucky tenants to live in that space — and next door to the Cross House. I’m curious as to what kind of wood stripper you use? Excellent! The Cross House has not only “Curb Appeal,” but is now increasing in “Vintage Appeal.” I admire your insistence and persistence.